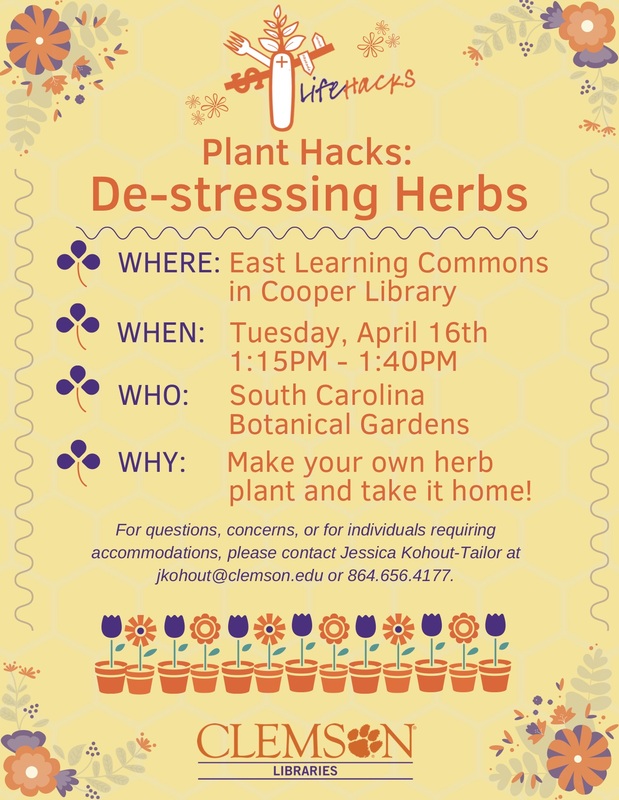 Join us as we welcome Sue Watts from the South Carolina Botanical Gardens to Cooper Library on April 16th from 1:15-1: 40 PM for our last Life Hacks program. She will be presenting some plant hacks on herbs that can help to de-stress. Participants will also be able to make and take their own herb plant while supplies last. 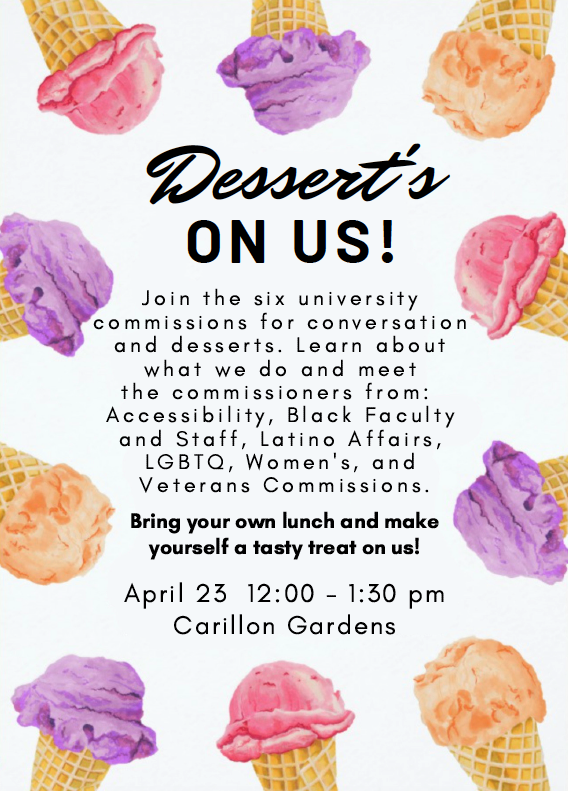 Drop by this informal session held in the East Learning Commons! The recipient of the award will be announced at Employee Recognition Day on May 13th. Final call for information about YOU for Employee Recognition Day. The information will run on a screen during the event and be preserved online in a special issue of Library Announcements. Thank you to everyone who has already submitted. Please submit any awards or recognitions you received since the last Employee Recognition Day in May 2018. This includes information from 2019. These can include being selected for a University or professional committee, recognition by a professional association, grants awarded, publications or conference presentations, etc. 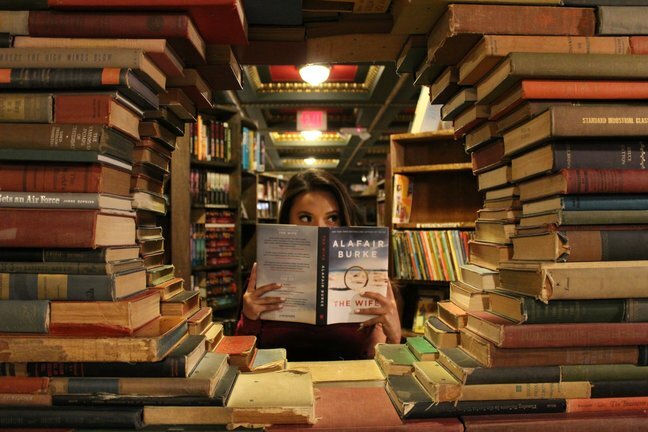 Anything related to your work for Clemson University Libraries. 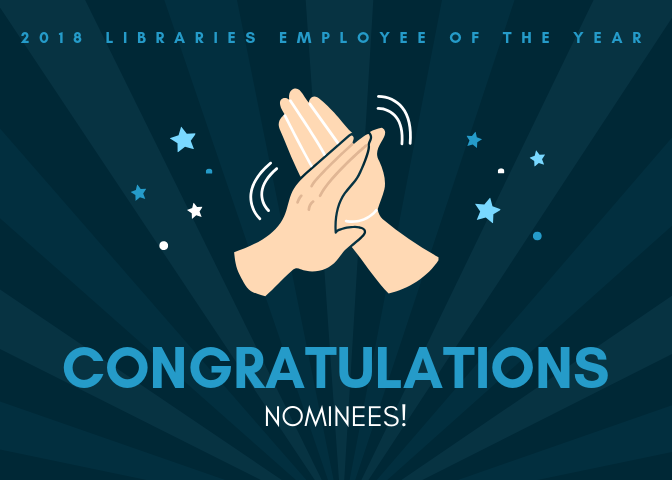 OR if you know of a colleague or team member who has an award or achievement from 2018 that should be recognized please send that information (with their permission). Join me in congratulating Kirstin O’Keefe for completing the Bepress Repository Manager Certification training! 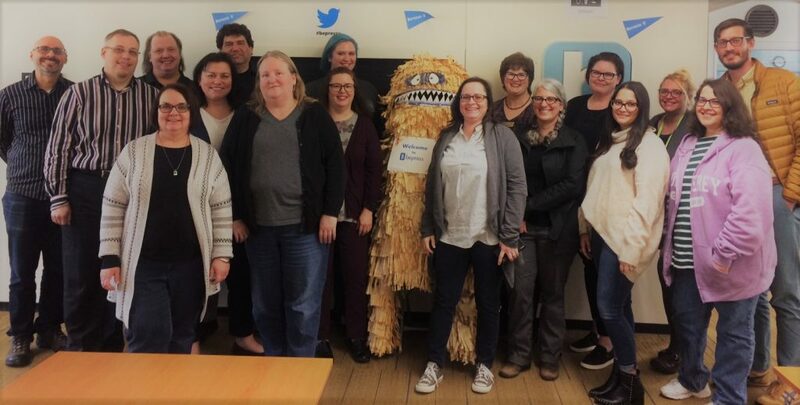 Kirstin participated in this intensive three-day workshop for institutional repository administrators, where she learned crucial skills and expertise to manage our IR software, Digital Commons, and strategies to help advance our initiatives in scholarly communications. Kirstin came away from the certification course with an in-depth knowledge of the Digital Commons software; a concrete set of IR goals and benchmarks; a personalized action plan and extensive resources for achieving those goals; and a network of professional relationships both with other IR administrators and with the staff at bepress. Besides the usual research, reference, and instruction, it was an incredible week of outreach for the Special Collections and Archives that led to many new contacts and potential donations to the Archives! Thank you to Michelle Voyles and Krista Oldham for going above and beyond in creating successful events!Call My Name Book of Names LaunchOn April 4, Dr. Rhondda Thomas and her research team formally launched the Call My Name Book of Names with a reception at the West End Zone. 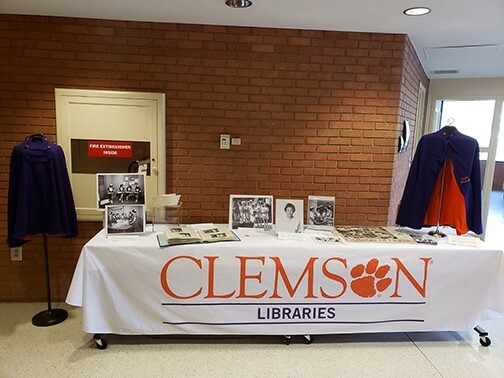 The Special Collections and Archives created an exhibit with documents and photographs about the Six Generations (Enslaved Persons, Sharecroppers, Convict Laborers, Wage Workers, Musicians, and Faculty, Staff, and Students) of the project. 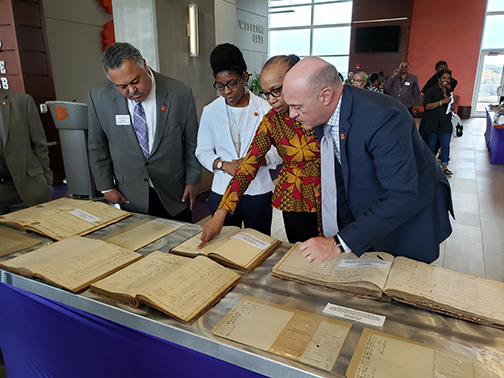 It was a great evening of meeting descendants, alumni, and retirees and making new connections for the Archives.Photo – Dr. Rhondda Thomas showing President Jim Clements and Max Allen the Slave Petitions brought to the event by Steve Tuttle of the South Carolina Dept. 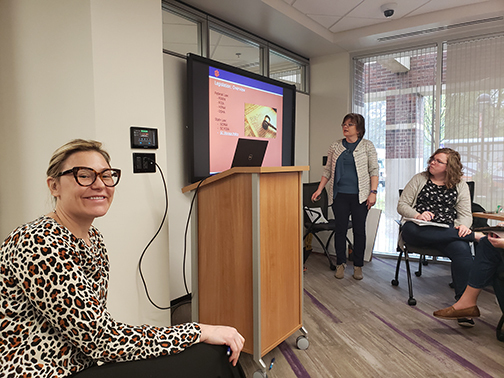 of Archives and History.Records Management 101 WorkshopOn Friday, April 5, the Records Management Team hosted their first of five workshops in the Records Management Training Series. When Records Management 101 filled up very quickly with a long waiting list, we offered a second time in the coming week. When the second one filled up within a half-hour, well, we felt compelled to offer a third offering of RM 101 . . . and it also sold out! On a rainy Friday, we had a full house of the Clemson employees learning the basics of how to manage their records. A great day for Records Geeks!Photo – Michelle explaining the intricacies of the laws governing public records and Krista on deck next to explain some of the terminology we use.School of Nursing 50th Anniversary CelebrationOur busy week came to a close on Saturday, April 6, with an exhibit on the history of Clemson’s School of Nursing. It was a great time hearing the alumni share their memories of clinicals, uniforms, and hats. 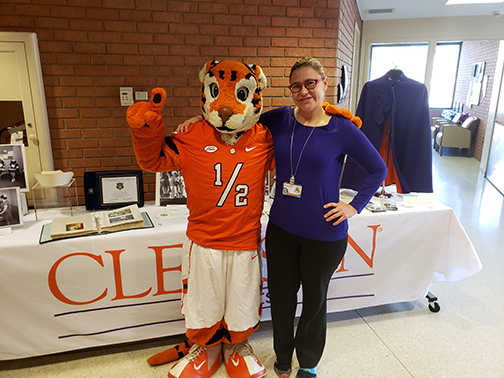 Many new contacts were made to help us strengthen the nursing history in the University Archives.Photo – School of Nursing exhibit at Edwards HallPhoto – You are not part of the Clemson Family until you have your picture taken with the Tiger or the Cub! Krista Oldham’s first picture with the Tiger Cub. Student workers may only be paid with Federal Work-Study (FWS) funds for work performed through the last day of classes, Friday, April 26, 2019. Students who will continue to work during the summer MUST be transferred to 100% departmental funds (account 5150) effective April 27, 2019. **Please note that the FWS program will not offer FWS funding for this summer. Just a reminder requesting our (May) graduating student assistants to complete a bookplate form. The Library also has a gift for each graduate. Please let us know if we have any soon-to-be graduates! Ask your student employee complete the form (http://library.clemson.edu/depts/staffweb/bookplate-request/) as soon as possible so that the bookplates and gifts can be prepared. Photo ops will need to be scheduled as well.